Because of the unique shape of his trumpet's bell and his puffed out cheeks, John Birks "Dizzy" Gillespie is one of the most recognizable and popular figures in jazz history. He had a unique look, making the beret, shades, and goatee fashionable amongst the bebop players. He had a uniquely athletic sound, playing perhaps higher and faster than anyone before him. He improvised with astonishing accuracy and inventiveness while playing at breakneck speeds, and redefined the capabilities of the trumpet. He was born in 1917 and when he started playing, he copied Roy Eldridge, the highest and fastest trumpet player of the day. Diz became so good at it, that when Eldridge left Teddy Hill's swing band in 1937, Dizzy replaced Eldridge. He later worked with Cab Calloway, but was too much of a free-spirit for Calloway, and also, Dizzy's breaking away from the Eldridge influence and starting to experiment with sophisticated solos based on harmony while on the bandstand didn't set well with Calloway. In the 1940s, Dizzy met up with Charlie Parker, Kenny Clarke, Thelonious Monk, and Charlie Christian in the after-hours jam sessions and together, they developed bebop. Parker and Gillespie made some of the most glorious bebop music ever together in the forties. They were the perfect fit, because they had similar ideas about the music and because Gillespie was one of the few trumpeters who could keep up with Parker, both in understanding of harmonic theory as well as virtuosity. Eventually, they split up, as Dizzy, who did not use drugs, grew weary of Parker's frequent drug-related absences on stage. Dizzy then went on to form a bebop big band and did more trailblazing, as he fused Cuban rhythms to his music (called cubop). 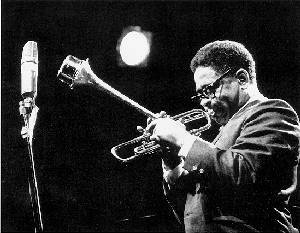 From the 1950s on, Dizzy traveled frequently on goodwill tours and playing in small groups. In the 1950s, he spent 2 years travelling as the leader of the first officially U.S. State Dept. sponsored overseas tour. In his 70s, he led the United Nations band, shortly before he died, in 1993. He also encouraged many young trumpet players, such as Fats Navarro, Clifford Brown, Lee Morgan, and two younger players that he considered "musical sons:" Jon Faddis and Arturo Sandoval. Unlike many bebop musicians, who were separatists, Dizzy actively went out and drummed up support and won friends to the music. Along with showmanship (which is where his nickname is derived), he became an ambassador for jazz around the world, campaigning for Jazz's acceptance as African-American classical music. He was to post-war jazz what Louis Armstrong had been to in it's earlier days. Along with this, he was a lifelong campaigner for civil rights and fair treatment of all artists. Besides being a fun-loving personality and a master musician, Gillespie composed a lot of jazz standards, such as Night in Tunisia, Bebop, Oop Bop Sh-Bam, Groovin' High,Woody 'n You, and Salt Peanuts. As a side note, the story of his horn goes like this. One night, he had some musicians over at his house. One accidentally sat on his trumpet and it bent the bell upward. Dizzy, being the fun-loving guy that he was, picked it up and started playing it, and found out that he liked, because, as he said, "I hear the sound quicker." He had an instrument designed this way and it became one of his trademarks. Bird and Diz - one of the very best pages I've ever seen! Wheatly Aycock's Dizzy Gillespie page - a fan's tribute.